For those that frequent here you have heard me speak time and time again of J. Bruce Fuller and Yellow Flag Press. I have been lucky to be a part of numerous projects with the press. I am happy to announce the upcoming anthology with will include all the poems and artwork from the Vision/Verse reading series from 2009-2013. There is a kickstarter page, and while the project has exceeded its goal, please still donate to help fund the press and cover other press related expenses. Yellow Flag Press is excited to announce the upcoming release of our first perfect bound release, Vision/Verse 2009-2013: An Anthology of Poetry. This is a 6"x9" trade paperback featuring 33 poets and 100 poems. 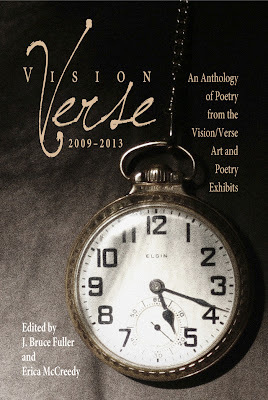 Pre-orders for this anthology are available exclusively through our Kickstarter page, http://www.kickstarter.com/projects/1604284672/vision-verse-2009-2013-an-anthology-of-poetry. Please check out some of our unique rewards and get your copy of this anthology. Cover art by Heather Arsement, with additional art by Brendan Egan, Heather Ryan Kelley, Sue Zimmermann, and others. Edited by J. Bruce Fuller & Erica McCreedy. Layout and design by Lou Amyx.